Century Cycles Blog: Help Save Everett Road in the Cuyahoga Valley! The jurisdictions that are responsible for the maintenance of Everett Road have decided that it is not worth the resources to keep it open, and are currently considering vacating this road and allowing it to deteriorate. 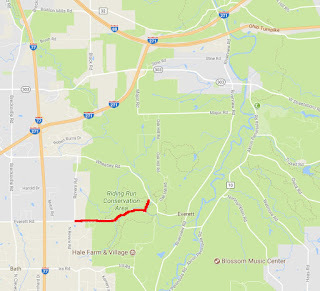 Members of the Akron Bike Club and other concerned local organizations have taken up the cause to save Everett Road for cyclists, hikers, and runners, but they need your help. Those who used Everett Road all the time (back when it was rideable) know that it was the safest route for cyclists in and out of the Cuyahoga Valley. It gave us a route that wasn’t as busy as Wheatley Road, wasn’t as steep as Ira Road or Bath Road, and allowed access to some of our favorite routes near the Cugahoga Valley National Park. If you are available, please attend the November 13 (next Monday) meeting of the Summit County Council, at 4:30 PM in the Council Chambers (on the 7th floor of the County Administration Building) in Akron. There is a parking garage on 200 S. High Street, directly across from the County Court House. Once in the parking garage, follow hallways leading to the County Administration Bldg. and take the elevator to the 7th floor. You can obtain a validation sticker in the Council Chambers and park for free. During that meeting, the Council will be taking definitive action on a Resolution regarding the future of Everett. There is an effort to amend the Resolution to provide through May 1, 2018 to explore turning the roadbed into an all-purpose trail. If you live in Summit County, please email your Councilperson about this. Send a short message indicating why Everett Road should be kept open for cyclists, hikers, runners, etc. Please share this message broadly. We need as many voices ASAP to keep the discussion – and, hopefully, Everett Road – open.